A Santa Clara County Sheriff’s deputy is facing the end of his law-enforcement career when he is sentenced next week for drunkenly flashing a gun at a Jack in the Box drive-thru in early 2016. 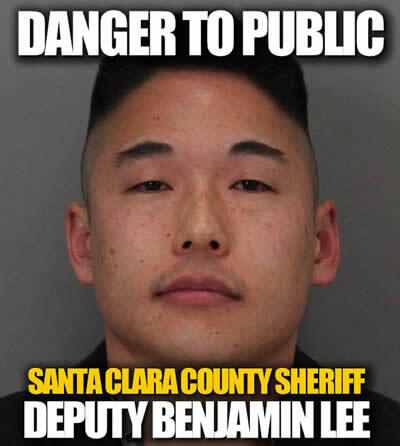 Benjamin Jae Lee, 34, was convicted by a jury June 29 of one count of brandishing a firearm and two counts of driving under the influence of alcohol, all misdemeanors, according to court records. Tran said Lee faces a minimum of 90 days in jail when he appears for sentencing Aug. 18 before Judge Vanessa Zecher. Lee has been out on bail since his January 2016 arrest, and has been on paid administrative leave from the Sheriff’s Office. There should NEVER be second chances when any form of deadly force are involved this is a bad officer plus the fact he has alcohol issues.